Previous research investigating visual feedback and postural control has focused on static posture while subjects attempt to keep their center of pressure on a visual target on a computer screen. This method of application has been met with mixed results regarding improvements in balance ability. This may be related to the variable that is controlled by the feedback, or the method of feedback training. Moreover, most falls occur during movement or during transitions from stationary positions to moving activities. The purpose of this project is to improve balance control during walking through the use of a novel application of visual feedback. 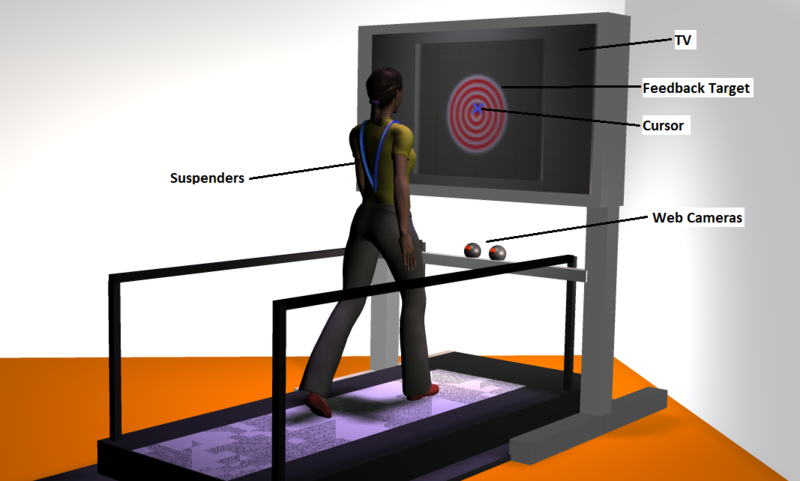 Subjects walk on a treadmill in front of a LCD TV with feedback about trunk movement displayed relative to a target. Older adult subjects with balance difficulties are recruited in an intervention consisting of 4 weeks of visual feedback training on a treadmill 3 times per week. Participants will be tested using standard clinical assessments of balance and gait pre- and post- intervention. Anson E, Jeka JJ (2014) Virtual reality balance training in rehabilitation. In Weiss PL, Keshner EA, Levin M (Eds), Virtual reality for physical and motor rehabilitation. Springer: New York. Anson E, Agada P, Kiemel T, Ivanenko Y, Lacquaniti F, Jeka J (2014) Visual control of trunk translation and orientation during locomotion. Experimental Brain Research, 232(6): 1941-51. Anson E, Rosenberg R, Agada P, Kiemel T, Jeka J (2013) Does visual feedback during walking result in similar improvements in trunk control for young and older healthy adults? Journal NeuroEngineering and Rehabilitation, 10:110. doi:10.1186/1743-0003-10-110.